Back in the day, I joined carloads of other Venice Beach locals with their party hats on and headed south into Baja, Mexico. The first pit stop was Rosarito to grab a few beers on the beach, then on to Ensenada to inflict more self-damage at Hussong’s Cantina. Rosarito was a wide spot in the road then, and Ensenada was a dusty fishing town of only 20,000. Hussong’s is still a classic old-school saloon, right up there with Sloppy Joe’s in Key West and the old Oar House in Santa Monica. Founded in 1892 as a stage coach stop (horses were shod in what is now the parking lot), Hussong’s still holds Ensenada liquor license #002. That trek south continues today, but what a difference some time and the North American Free Trade Agreement (NAFTA) has made. Rosarito Beach now sports numerous oceanfront high-rise condos and hotels. The population of once sleepy Ensenada is pushing 500,000, making it the largest city in the State of Baja. Along with ever-present commercial and recreational fishing, tourism, and agriculture are the next largest industries. Ensenada also boasts aerospace manufacture, medical research, and winemaking. The deepwater harbor is busy, seeing multiple cruise ships weekly, and box ships working the west coast of the Americas and Asia routes are frequent visitors. The Mexican Army and Navy maintain bases here, so along with the local and federal police, they maintain a visible and effective street presence. Spring is prime cruising time on the west coast, with great weather, calm water, and minimal fog. This is an easy and relaxed trip, with no topographical cautions as when transiting north from del Rey. It’s roughly 115nm to San Diego, then another 70 to Ensenada. Prior to San Diego there are several interesting harbors with boater services, so pre-planning isn’t important. I headed my Nordic 32 Norma Jean south in mid-April, with a first stop at Newport Beach for fuel and an overnight. Fuel prices in Marina del Rey are very expensive, and Hill’s Boat Service is usually $1 per gallon cheaper (for full service, too). I took a guest slip this time, and rode my bike over to Main Street on Balboa Island to look around the shops, then onto the ferry for the quick ride to Balboa Peninsula. It’s a fun combination of an amusement park and waterfront, and I had a great meal there at Newport Landing, just north of the ferry dock. Heading out the next morning, I planned to stop at Mission Beach, just north of San Diego. There is a serious kelp patch off La Jolla, so stay wide instead of trying to cut the corner. After entering Mission Beach, make a port turn into Mariners Bay, an excellent holding anchorage. I always opt for the north end, at Bonita Cove—it’s a pretty spot, surrounded by palm trees and the beach. It’s easy to dinghy ashore, cross the land-spit, and visit both Belmont Amusement Park and the oceanfront at Mission Beach. I had a terrific burger at the Coaster Saloon. I pulled anchor the next morning at 0300. On every trip, even when not necessary, I run a few hours in the dark to keep my night skills tuned. I want to always be comfortable with working in the dark, adjusting electronics night screens, etc. It was an easy run to Ensenada, where there are three primary choices for docking. The Hotel Coral and Marina is about 3nm north of Ensenada Harbor. It is a nice marina, with all the facilities of a hotel and spa; however, it is isolated from downtown Ensenada. Once in the harbor itself, Cruiseport Village Marina is tucked in behind the cruise ship docks—close to downtown, but still a substantial walk. Both of these marinas are relatively expensive, but with the usual marina ambience of the United States (if that is your choice). My more rustic selection is Baja Naval Marina and Boatyard, right on El Malecon (the waterfront promenade), and across the street from downtown. Located behind the Civic Plaza, it is easy to find—just look for the giant Mexican flag flying on a 75-meter pole. Giant is the right word—the flag measures 25-by-50 meters and weighs over 500 kilos. The boatyard does beautiful work, and allows owners to stay on board while in the yard. The marina is inexpensive with 24-hour security, spotless restrooms, wi-fi, and free phone calls to the U.S. Since it is open to Ensenada harbor, there can be surge on occasion, but nothing that a couple of extra lines won’t handle. Rogelio Gregg is the ever-gracious harbormaster. After arrival, it is necessary to check in with the port captain and Immigration. Bring your passport with you, and copies of your current insurance and documentation. Your marina will help you prepare your papers, and the check-in offices are consolidated in one building at the north end of the harbor. El Malecon is a combination fisherman’s wharf and landscaped promenade of over one mile. The south end is anchored by the Civic Plaza; at the north end is the open-air fish market and most of the activity. Here is where charter fishing is based, along with harbor tours, a multitude of shops, and outdoor spots serving various tacos and seafood cocktails. I’m a big fan of a place called La Playa. I went by the fish market most days, buying fresh octopus and other fish. It’s a fascinating place just to watch the activity and people. I love the fabric of life in Ensenada. Having morning coffee in the sun downtown, I watched merchants clean the sidewalks in front of their shops with a broom before putting out their wares. There wasn’t a leaf blower in sight (or hearing for that matter). A pigeon casually strolled through the open front doors of Hussong’s, looking for uneaten peanuts among the shells on the floor. Pelicans perched on the stone seawall of El Malecon elicit gleeful shrieks from young children on a Sunday outing with their parents. Local festivals are colorful and frequent. Once in town, there are the usual shops catering to tourists and cruise ship passengers along Avenida Lopez Mateos. Take your time, overlook the constant patter, and a perfect treasure will appear. I had been shopping for a leather knapsack, and since I didn’t find what I wanted, I stopped in the Sonora Leather Shop where they were happy to make one exactly as I wanted. With a strong dollar, everything is relatively inexpensive. After a shopping afternoon, it was time to head to Hussong’s for a beer or two, and then get some dinner. Right next door is Taqueria Mexico Lindo, the perfect spot for some great tacos. Back on Lopez Mateos, we passed by El Charro, and their display window with chickens spit roasting over a wood fire. Sightseeing opportunities abound. The nearby Cultural Center, a restored 1930s casino, hosts a museum and beautifully landscaped gardens with fountains and statuary, detailing the history of Baja. 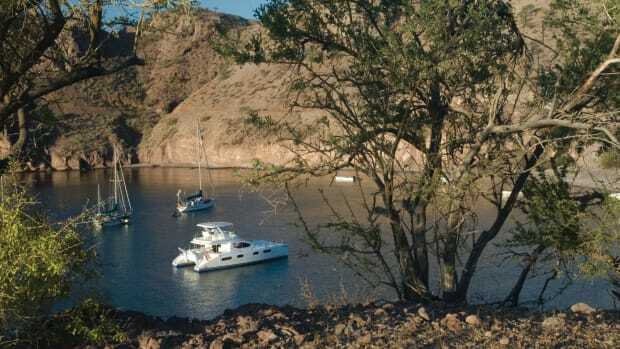 On cruise ship days, buses are available just north of Baja Naval offering trips to wineries, and also to the Bufadora. This is a fun half-day trip. 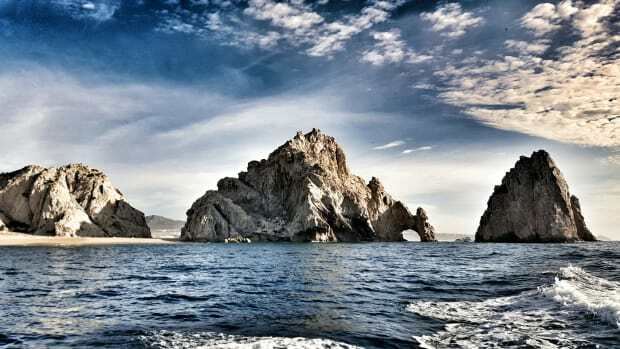 The Bufadora is on the southwestern tip of Bahia Todos Santos, and is the second largest natural tidewater blowhole in the world. Depending on the tide, water and foam can spew 75 feet into the air. There is also a colorful shopping street, with prices and products equaling if not better than downtown Ensenada. Prior to departure, it’s necessary to check out with the port captain. This process will require two separate trips to the office, and the cost was U.S.$18. Once you pick up your exit papers, you have 48 hours to depart the country. The first required stop will be the customs dock on Shelter Island in San Diego to get U.S. clearance. Raw meat, eggs, and fruit (along with excess alcohol) will be confiscated. Customs agents will also request and take one stamped copy of your Mexican exit permit. If you don’t already have a current U.S. Customs Decal, it will be necessary to buy one then (about $28). Should you have the time, this is the perfect opportunity to stay and see the attractions in San Diego. Another option if you are heading back up the coast is to stop in Oceanside, and from there to Avalon on Catalina Island. Whatever your choice is, I suspect Mexican food is off the menu for a few days—at least until you get home and begin trying to re-create the foods you loved while in Mexico. Buen apetito!